This category features all post related to Project Watershed’s GIS/GPS/SHIM etc. mapping activities. Plans announced for process to modernize Canada’s federal freshwater laws. The Comox Strathcona Waste Management (CSWM) service recognizes the ongoing challenges this region experiences with illegal dumping and has recently contracted Wedler Engineering LLP, in partnership with Project Watershed, to map illegal dump sites in the Comox Valley and Strathcona Regional Districts. This initiative’s first step was to meet with stakeholders (including private industry, landowners, environment groups, community volunteers and local government) to explore and get feedback around the present situation, to identify efforts to combat the issue and to strategize ways to halt illegal dumping in the area. The next step is to reach out to the public by providing the tools to be part of the solution. A Facebook group page “Help Prevent Illegal Dumping” has been created as a place where concerned citizens can join to support the project, by sharing photos and information including GPS coordinates to expand the current database. The second tool is a worldwide application called “TrashOut” that can be downloaded to a smartphone. This app allows users to start reporting illegal dump sites by taking a photo of it, and commenting with additional information as such as size and type of material. The report will then appear in a “TrashMap”. Once you have downloaded the app you can assign “Comox Strathcona Waste Management” as your organisation. For more information on the project and to learn more about illegal dumping visit www.cswm.ca/illegaldumping. Residents can also send photos of illegal dump sites for mapping to cswmplan@wedler.com. The Comox Strathcona Waste Management (CSWM) service is a function of the Comox Valley Regional District (CVRD) and is responsible for two regional waste management centres that serve the Comox Valley and Campbell River, as well as a range of transfer stations and smaller waste-handling and recycling facilities for the electoral areas of the CVRD and the Strathcona Regional District. The CSWM service manages over 100,000 tonnes of waste and recycled material and oversees a number of diversion and education programs. Breaching the Hilton Slough will allow (tidal movement of water into the now stagnant algae slough). 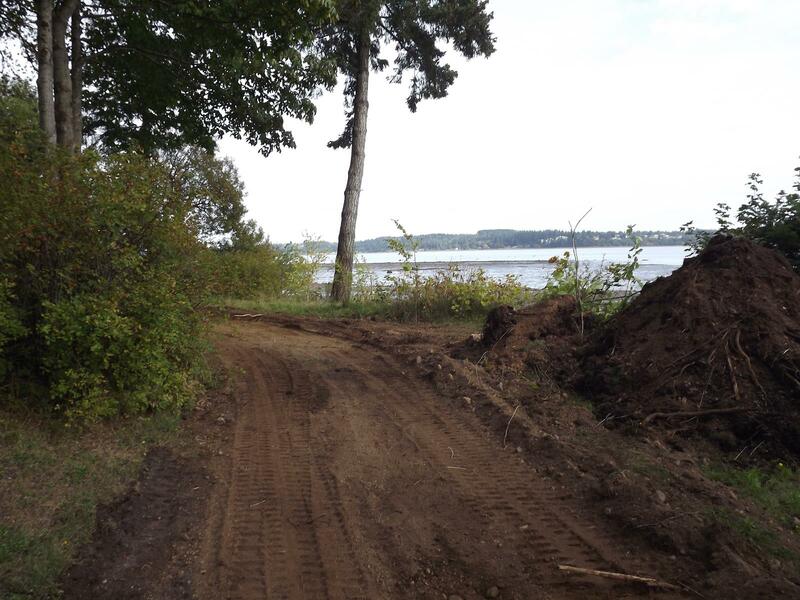 This will encourage a board range of marine flora and fauna to access that area. Once the slough is breached salt marsh will be added both inside the lagoon and outside along the foreshore. 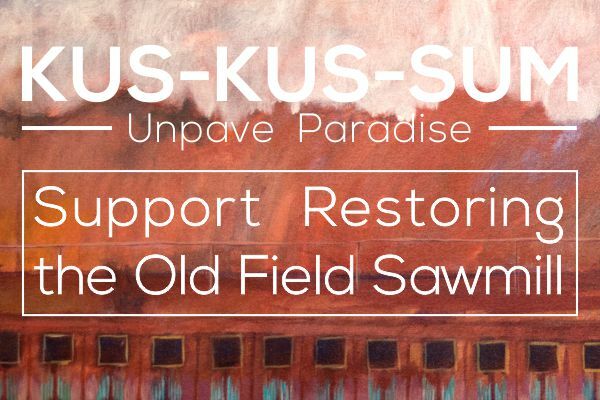 This will help to restore the saltmarsh areas back to their original condition before the railway construction and the booming ground activities damaged much of this area. The saltmarsh restoration process will include mapping, foreshore saltmarsh vegetative reports and construction berms and saltmarsh benches. Salt marsh is an important habitat type in estuaries. Unfortunately it is also one of the most threatened. Salt marsh losses in estuaries in BC range from 50 to 93%. Salt marsh not only provides habitat and food for marine species but also sequesters carbon helping to mitigate the impacts of climate change. To see the construction as it progresses visit http://roystonhouse.ca/blog/. This blog by Ross Munro of Royston House shows pictures and brief comments on the development of the trail in his area. 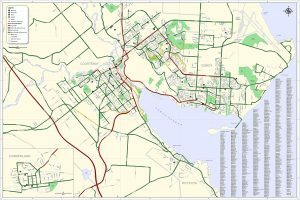 Project Watershed, a Comox Valley environmental stewardship organization with a unique state of the art GIS/GPS Mapping Center, announces the presentation of a free online printable set of walking maps for Valley Residents and visitors. The simplest way to get to these maps is to visit Project Watershed’s new website at www.projectwatershed.ca, where there is a link in the right hand column. Once on the map page you can click right on the 30+ trails either in the map frame on the right or the list of trails on the left. You can overlay the watersheds that your walk will go through on each trail. A description of your walk will appear on the left. Public Washrooms are indicated as is wheelchair accessibility along with other useful information. If you desire, you can print off individual maps or view on your smart phone or tablet. Funds to produce these maps were partially supplied by a grant in aid from the Comox Valley Regional District. “When I first came to the Comox Valley in 2000, no accurate maps for walking the area were available” says Paul Horgen, Chair of the Project Watershed Board of Directors. “There were some booklets for sale, but my wife and I use to get lost all of the time because they were not produced through GIS technology and therefore not very accurate”. The Comox Valley is a key tourist destination on Vancouver Island. Project Watershed feels that these free maps will be a welcomed community resource addition for all visitors and residents who enjoy the beautiful outdoors in the Comox Valley. Valley businesses can show their support for this endeavor right on the map site by making special arrangements with our Mapping Coordinator, Caila Holbrook at maps.projectwatershed@gmail.com or (250) 703 2871. People who would like to GPS trails not yet on the map or to add GPS information to existing trails can contact Mrs. Holbrook as well. To keep up-to-date with the resources that Project Watershed is creating and the projects they are working on check our website regularly. Map Image 10 km walk of town of Comox down to Goose Spit. 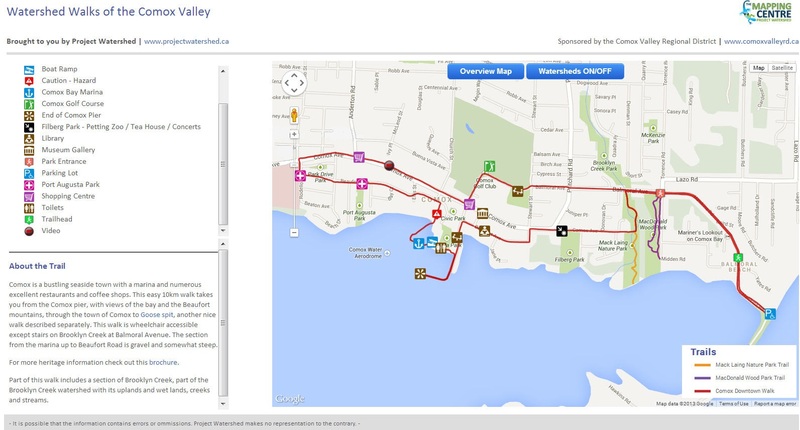 This map has a video link and is best used with recently published pamphlet Self Guided Comox Walking Tours Comox by the Sea available at the Discovery Centre and businesses in Comox. Elder College is offering this course (CVEC 6315) coordinated by Betty Donaldson on Thursdays from Oct 4 – Nov 22 from 11:30 – 1:00. It is not necessary to be a scientist to appreciate local watersheds that shape the Comox Valley: the Courtenay River (K’omoks) Estuary, the Tsolum and Puntledge Rivers, and 3 urban creeks. Volunteers who help sustain these shorelines and waters will share their enthusiasm for human and natural history, and identify the unique biodiversity features of each area. Weather permitting we will have one on-site class to view some spawning salmon. • In person at the North Island College Registration Office. The Mapping Centre of Project Watershed is embarking on an initiative to produce activity specific maps in the Comox Valley and is looking for your input. 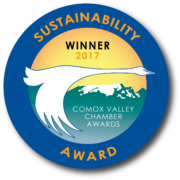 The Mapping Centre is the social enterprising arm of Project Watershed; a local environmental non profit organisation that is focused on stewardship, restoration and protection of Comox Valley Watersheds. Created in 2008 to utilize the GIS and GPS equipment and expertise Project Watershed has accumulated over the years, The Mapping Centre has delved into the business of map making. In March of this year the Broken Spoke Bike Shop in partnership with The Mapping Centre released the first ever Comox Valley Cycling Map. 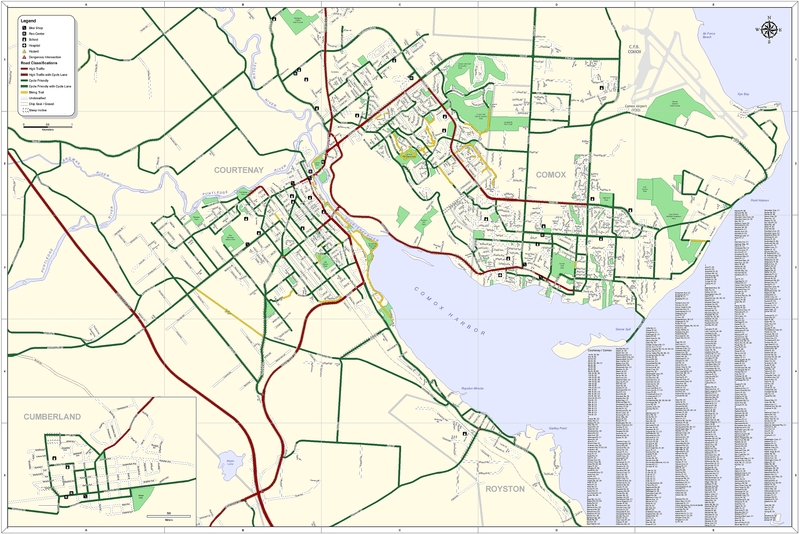 The Cycling Map has been a great success and now The Mapping Centre is working to produce an array of maps each focused on different activities in the Comox Valley. To guide the production of the maps the Mapping Centre is gathering input from locals and tourists. The Mapping Centre would like to know what maps are needed, what information is important to include etc… If you have ever wanted a map for an activity you participate in or can think of an activity that needs a map, the Mapping Centre is asking you to fill in their survey available at maps.projectwatershed.ca. The new map or maps would be available starting next year. Some of the ideas put forward already include a Water Sports Map, a Hiking Guide and an Artists Studio Tour Map. Other Comox Valley maps including an airphoto map of the entire Valley are also available from The Mapping Centre. If you are interested in helping to gather geographic information or have digital information for the production of activity maps please contact Caila Holbrook at maps.projectwatershed@gmail.com.